(Newser) – Donald Trump isn't the only one taking heat for tweeting an anti-Hillary Clinton image with a Star of David. Now his son-in-law, Jared Kushner, who owns the New York Observer, is dealing with fallout from one of his own employees. 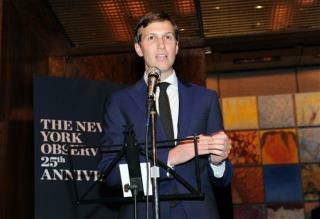 Entertainment writer Dana Schwartz penned a scathing open letter to Kushner, which appeared in the Observer Tuesday, after she said she was bombarded by anti-Semitic comments for criticizing Trump's tweet. After sharing some offensive responses, she took Kushner to task for turning a blind eye to Trump, noting, "[Don't] pretend you don't understand the imagery of a six-sided star when juxtaposed with money and accusations of financial dishonesty. I'm asking you, not as a 'gotcha' journalist or as a liberal but as a human being: How do you allow this?" She ended with Edmund Burke's famous quote ("The only thing necessary for the triumph of evil is for good men to do nothing") and her final statement: "Well, here I am, and here we are. Both Jewish, both members of the media. And you might choose silence, but I've said my piece." Dishonest Trump got the free publicity he wanted . . . who cares if he offended a few Jews, it was worth it to the presumptuous GOP nominee! Dump UNFIT & UNQUALIFIED Trump 2016 - Make America SANE Again! After all of this publicity in the Trump campaign, let's hope that no one ever does business with Trump or anyone in his family.